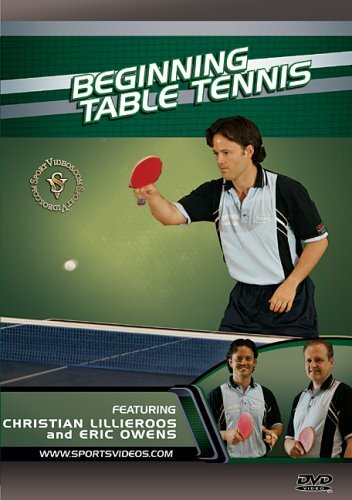 This comprehensive program teaches essential table tennis skills and strategies for beginning level players. Christian Lillieroos and Eric Owens provide students with a wealth of important tips to establish a solid foundation and significantly improve their skills. Among the topics covered are: grip, off table drills, games for large groups, timing, technique, serve, serve return and the rules and strategies for doubles and singles. This DVD is a great resource for new players and has more than enough detail to be beneficial for experienced players or coaches. About the Coach: Christian Lillieroos is the former coach at Texas Wesleyan University. He is certified by USA Table Tennis as a National Coach. He was nominated USATT Coach of the Year for 1997 and 2002. Eric Owens is a multi-time member of the US Table Tennis team. He is a US Men s Singles Champion, Pan American Gold Medalist, North American Doubles Champion, and four-time College Mens Singles Champion.